This travel trailer can turn your family trips into fun adventures every time. With room for six in this unit, bring along the grandkids for memories they'll treasure forever. This model features a front private bedroom with a pivot hinge door, plus two wardrobes for all your clothes. The chef of the family will love cooking in the rear kitchen that includes a three burner cooktop, a pantry, and a buffet the kids will love to sit at. The dual opposing slides open up the living area so you can relax like you do at home. For a cozy evening, sit back on the lounge chairs and enjoy the glow of the fireplace. Everyone will appreciate the large walk-in shower with a skylight that gives natural light. 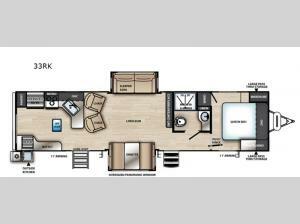 This travel trailer has many more features you are sure to love, including, an oversized panoramic window, an outside kitchen, and dual entry doors for added convenience!